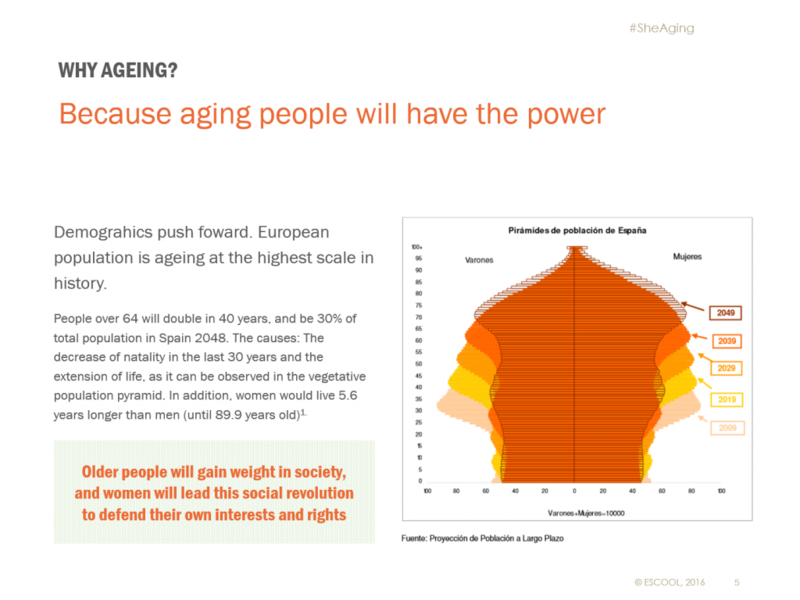 The impact on the economy of the European population demographic change and the empowerment of women are the two axes on which we build this She+Aging argument. 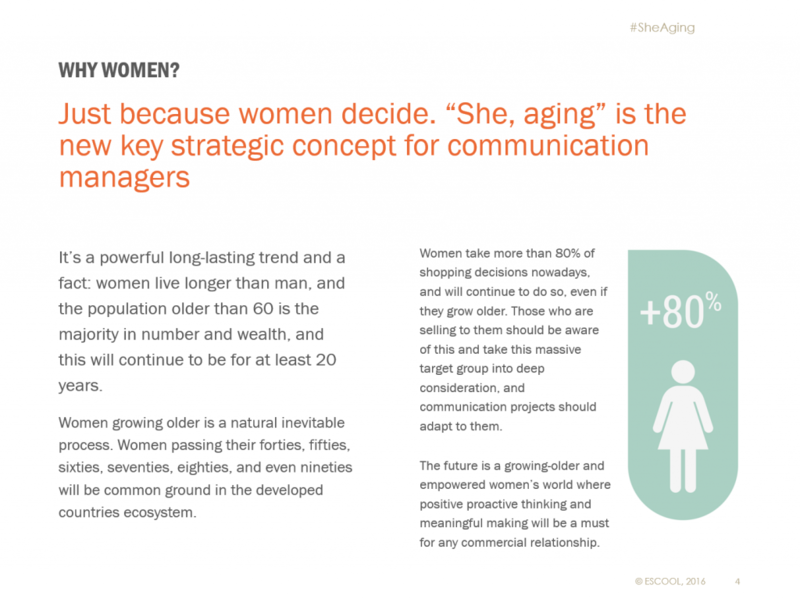 Being attentive to the challenges of our society, we compiled lots of data that explained this two macro trends in the #SheAging ebook in 2014. ESCOOL has presented this study to partners and interested people, who have had access to the digital document entitled #sheAging. Since then we are observing, with a critical eye, what matters to +40women, and we collect data which we analyze in a continuous way to identify what matters to them and how they would like communication to be addressing their issues. Much has changed the world in these four years and the new feminism and, finally, the empowerment of women, already resonates in the communication departments of many corporations. In 2018, #SheAging evolves and is more than a report, it is a creative consulting service that provides insights and inspiration to organizations that are sensitive to adult and elder women. 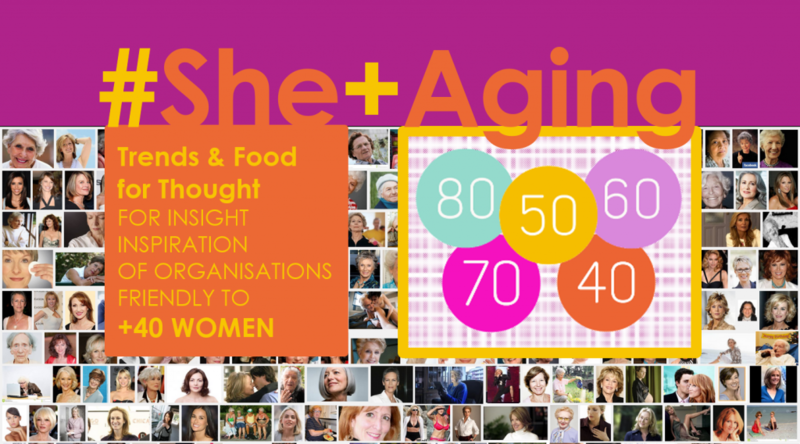 Trends & Food for thought for organisations friendly to +40women. She+Aging is a service of marketing intelligence that analyzes the engagement possibilities for our client’s projects. Workshop “SWOT She+Aging global trends” where the client team learns to transfer data, facts and global trends to a strategic Streghts, Weaknesses, Opportunities and Threads matrix. Inspiration, findings and consumer insights. We can send you a free copy of the slidebook 2016 Perspective Report if you write us.